Post-Script: Though this is a ruggedly-built machine, its Achilles heel might prove to be that small triangular cross-section belt, which I understand is well nigh impossible to acquire. Hopefully it'll continue to function for a while longer. Perhaps I should look into one of those Sony M-2000 units - for research purposes only, of course! 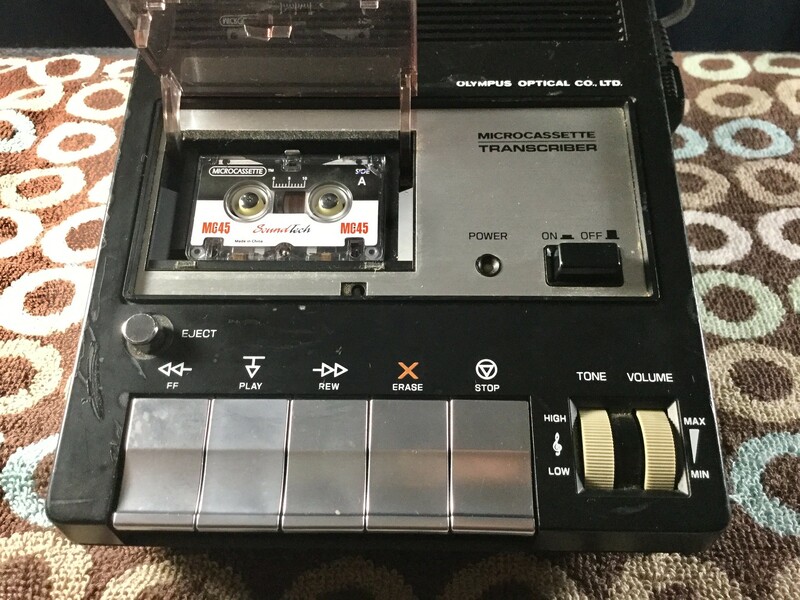 I was surprised by the frequency response of the tapes played in this device, even though they were recorded in a handheld microcassette recorder. Perhaps it's more than just the bigger speaker of the Olympus, maybe the playback amplifier has better response? Sounds like (pun alert) I should record some music into a microcassette, then play it through this machine and compare the results. Those Sound Tech MC-45 tapes look and sound pretty good, especially considering the price I paid on Amazon, just over $2 per tape. 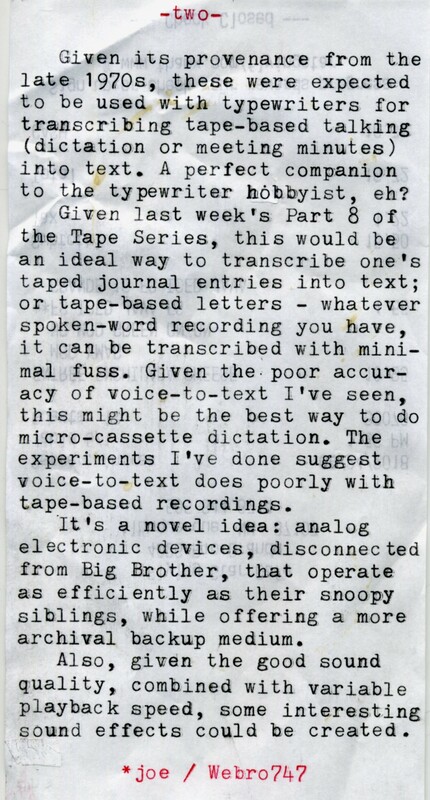 Good to know new tapes are still available, especially if one wants to do some tape-based journals and letters. 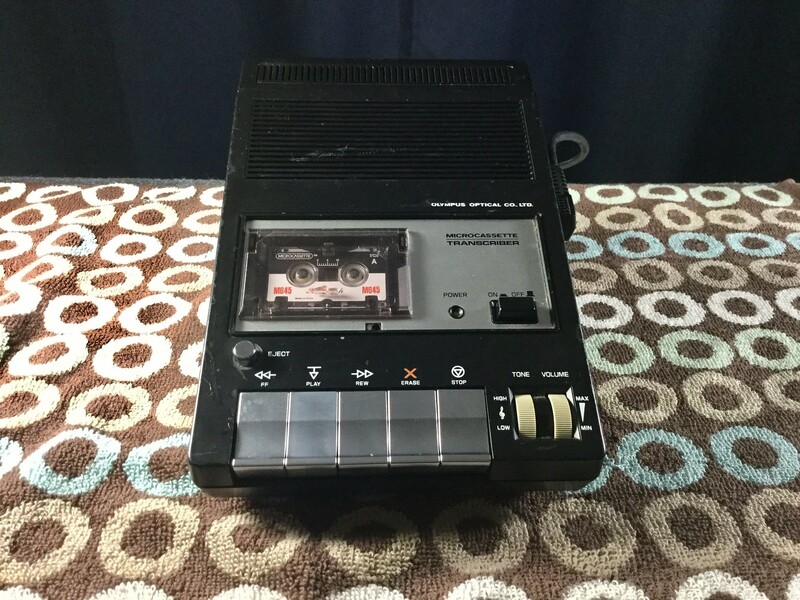 Here's the video about this dictaphone. 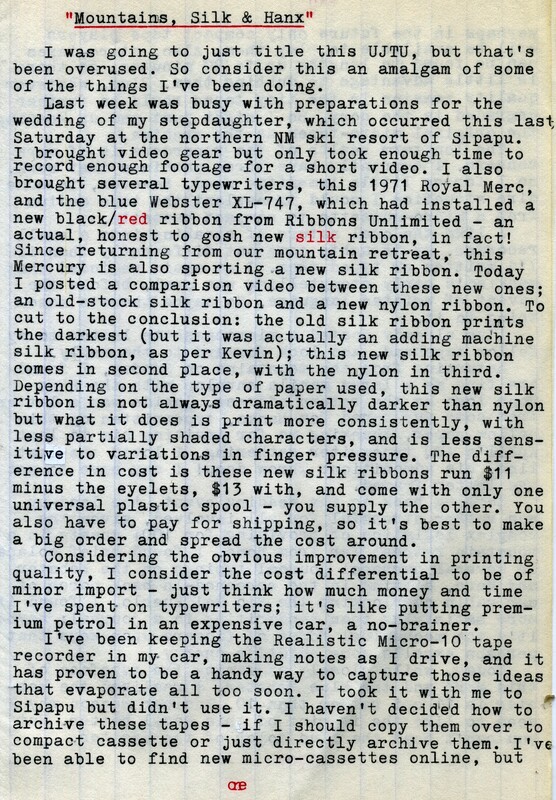 Typecast via Webster XL-747 (aka Webro), sporting a silk ribbon from Ribbons Unlimited. Post-Script: How about that silk ribbon, eh? The Merc Two has a new lease on life with the Ribbons Unlimited silk ribbon. There used to be a store in ABQ called the Sunwest Telephone Store. It was on San Pedro and Copper, across from the State Fair Grounds. Back in the late 1990s I purchased this new-in-box, never opened, Western Electric two-line dial telephone. My step-daughter wanted her own phone number, so we rigged it so she could switch to her line with the rotary switch on the phone. She's the newly married bride we celebrated in northern New Mexico this last weekend. 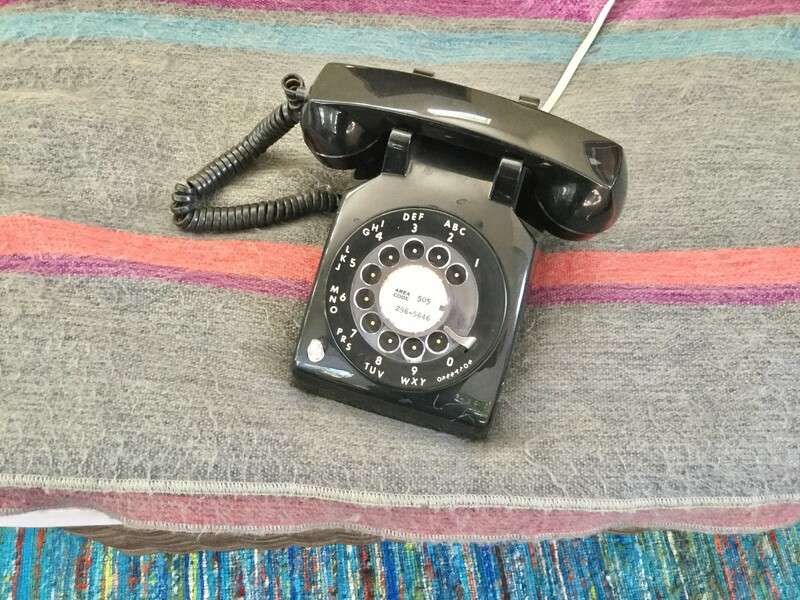 I used this phone for years, until I had some DSL speed issues and disconnected the dial phones. Probably should plug this one back in and see how it runs. Post-Script: The wedding event was wonderful, a huge affair that involved lots of planning and last-minute stress, as these kinds of things often do, but worked out great. The staff at Sipapu Ski Resort did a great job in hosting the event, and the bride and groom, along with their friends, were instrumental in tailoring the wedding to their individual taste. Post-Script: I started this twin typer video on Sunday but was interrupted by Labor Day festivities; then had to do some maintenance on my main evaporative cooler unit (replacing the fan bushings and motor). 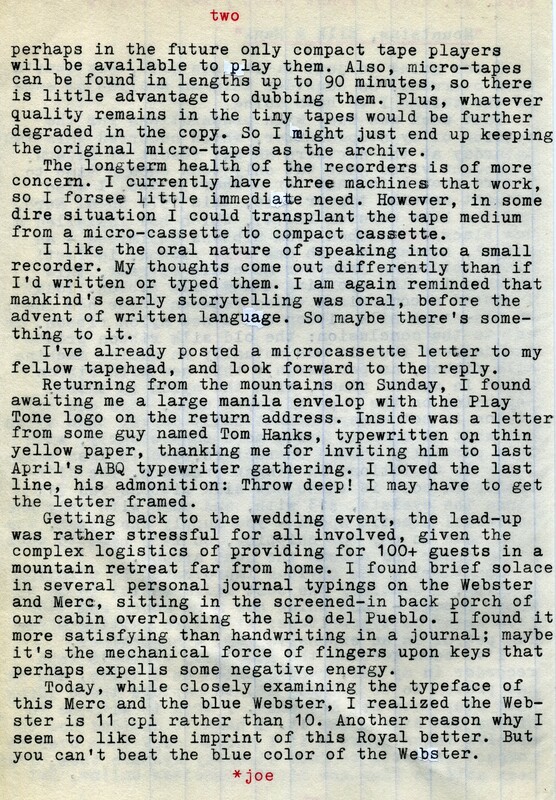 It started out with me breaking out the 1973 Mercury that's been in my collection since the mid-aughts - my "alpha" machine, the first one I can with certainty claim to have acquired because I was getting the typewriter bug and wanted a small portable; which I haven't used very much in the last few years and it needed more attention than I'd realized. I ended up doing a thorough cleaning and degreasing on it, in the process of making the video. Naturally, a comparison between both machines was in order. 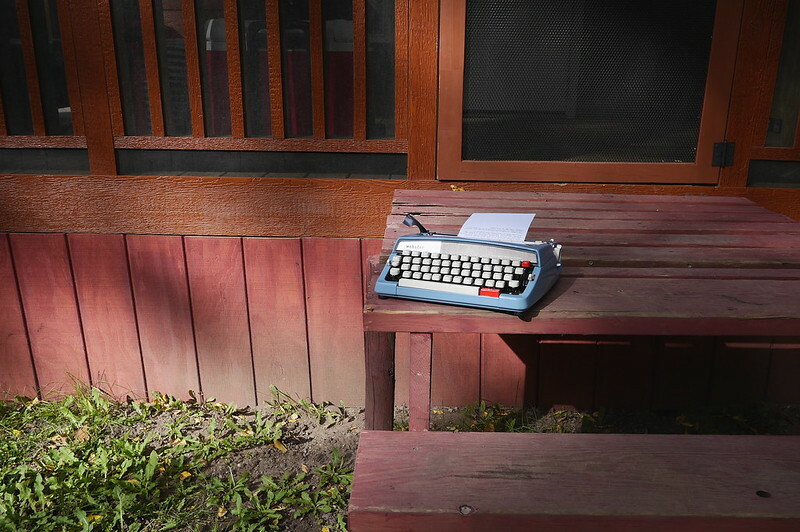 The 1971 model, new to me, had a bit easier touch; but now the other one feels better after the attention it's received. These machines were designed the way they were designed. You shouldn't expect them to have the touch of a different, lighter, machine. 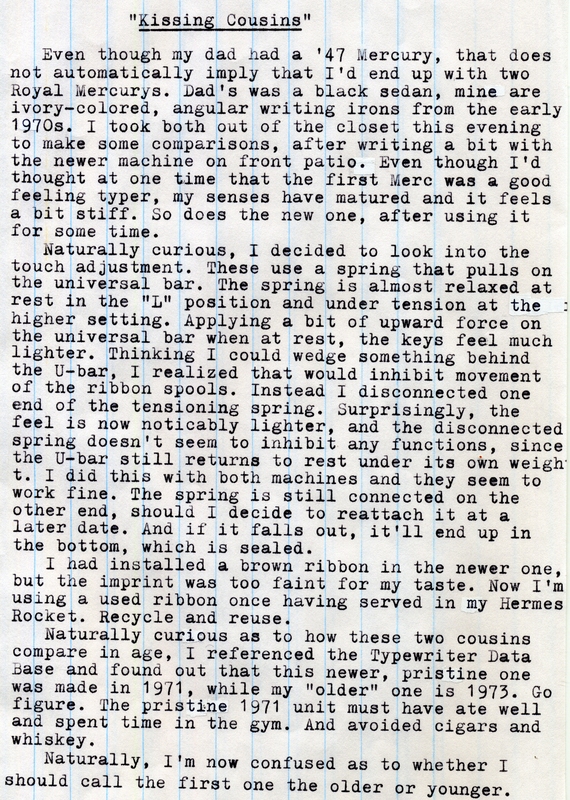 But the trick I did to the touch adjustment, disconnecting the spring that attaches to the universal bar, did affect a noticeable change. Which reminds me that my Brother Charger 11, lacking a touch adjustment, always felt a bit lighter in touch than the Brother-made Webster XL747 that has a touch adjustment; perhaps it's due to this same issue, that at the lightest setting the touch system always gives more tension to the universal bar than without. I'll use both of these Mercs for a time and see if I'm happy with them this way. Since I now have these two nearly identical machines, I figured some experimentation was in order. The natural thing would be to compare sound-deadening methods. 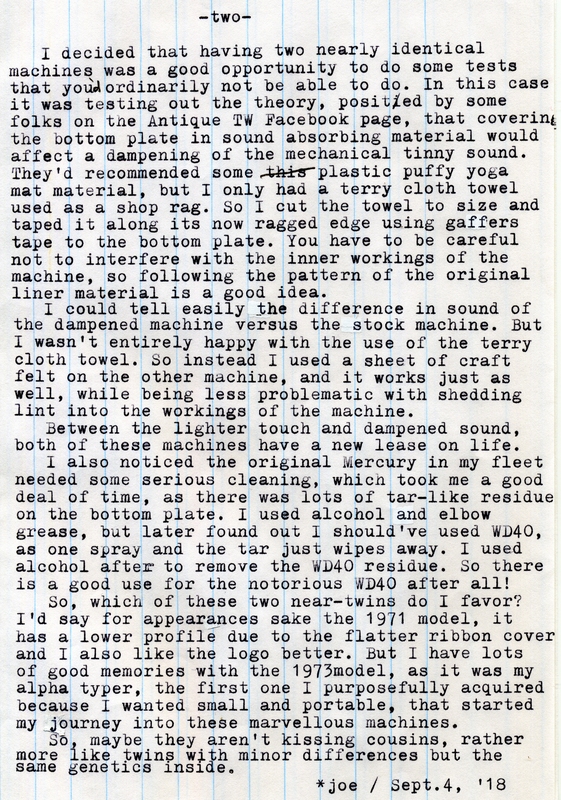 There has been some recent talk on the Facebook Antique Typewriter Group about using various materials in the bottom of the machine to absorb sound and prevent it from reverberating upward. With the 1973 model I used a terrycloth shop rag, cut to size and taped along its edges to the inside of the bottom panel using gaffers tape. Compared to the unaltered 1971 model I could notice a real difference, more in the muting of the bright metallic sounds, rather than an overall lowering of the volume. Then I used a sheet of craft felt in the bottom of the 1971 model and it seems to have about the same degree of sound deadening. Nothing dramatic, but a real improvement. Since this is an ongoing experiment and easily reversible, I can always take these out and try different materials in the future. 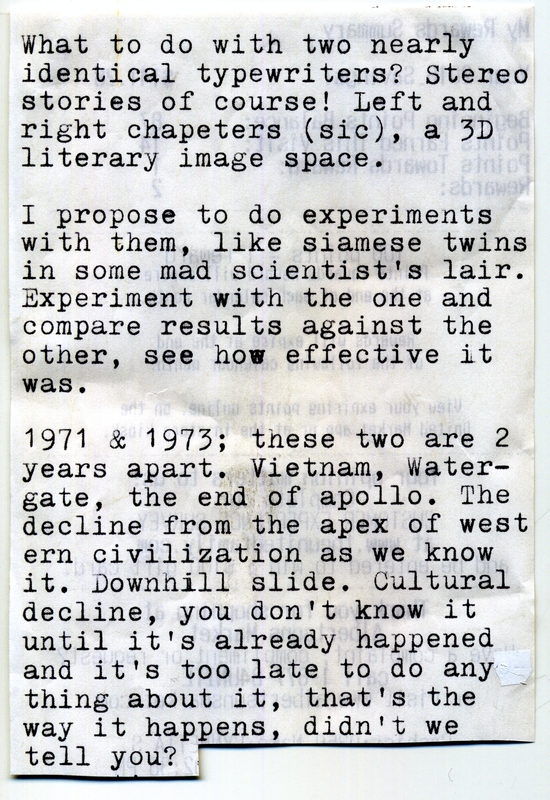 This is getting to be a habit, saving up 3-1/8" wide thermal-printed store receipts that are blank on the reverse side. 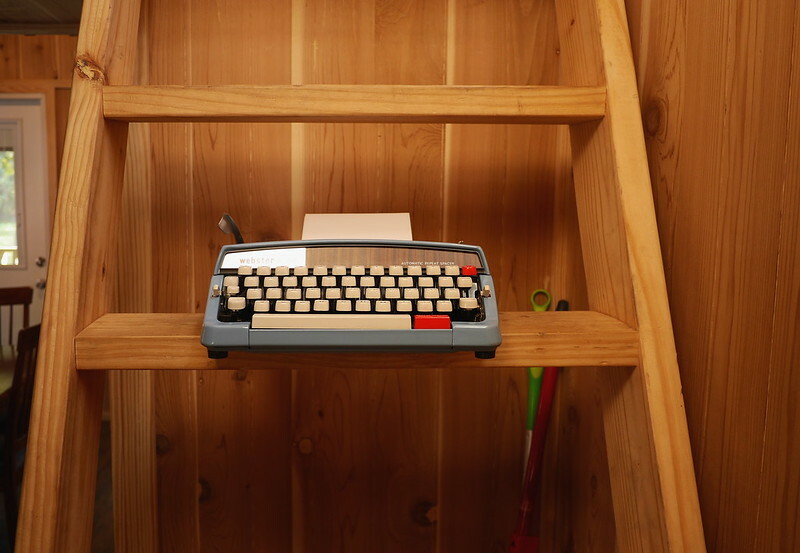 Free typing paper, for short ditties or poems. 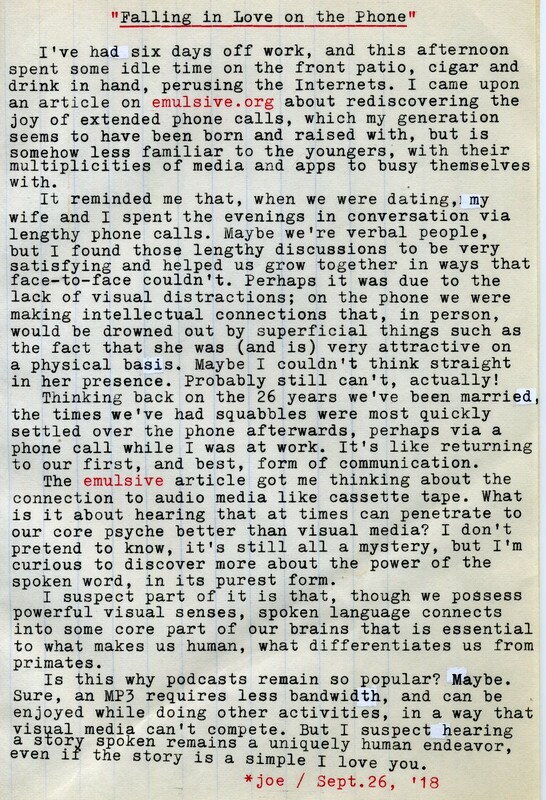 Nothing profound or earth shattering, but highly convenient, promoting that stream-of-consciousness creativity that can, on occasion, produce surprising results. 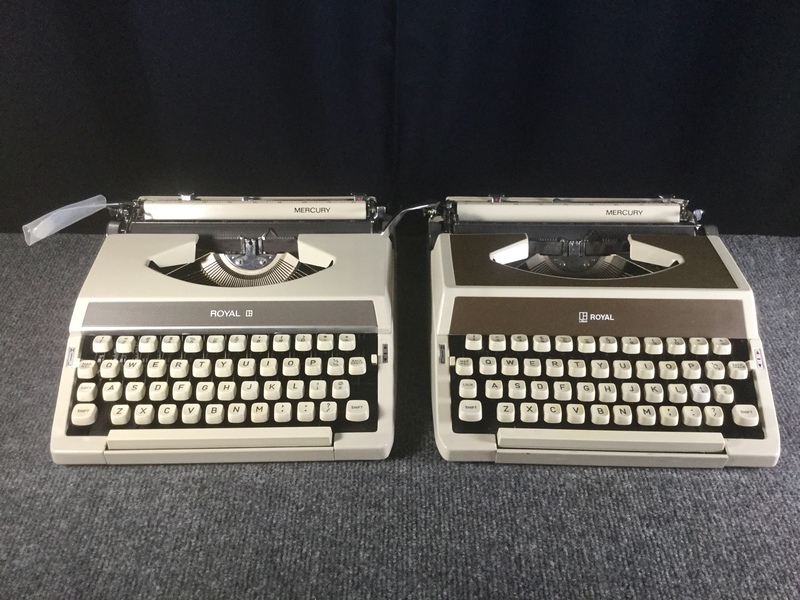 Here's episode 130 of the Typewriter Video Series, on these two siblings.